For those who believe that life isn’t about waiting for the storm to pass, Cleverhood is a lightweight, yet hardy rain cape that lets you stay the course. 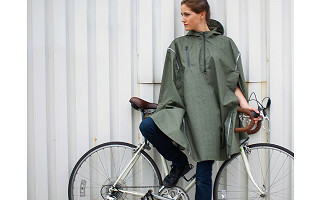 Designed for city living, cycling, and commuting, this raincoat is loaded with innovative features to help keep you and your backpack or messenger bag dry even in a downpour. Made in the USA of durable, waterproof fabric, tightly seam-sealed, and carefully crafted, the Cleverhood features a fitted hood with a large brim that keeps your face from getting wet without blocking your peripheral vision—it even fits comfortably under your bike helmet. An outer loop on the back allows you to hang a safety light for traveling at night (some styles also come with reflective trim). Velcro tabs enable you to streamline the cape for a more fitted look. Magnetic closures on the armholes are a snap to shut and elastic thumb loops keep the Cleverhood secure when riding in the wind and rain. With its water resistant zipper, the chest pocket is perfectly suited for your wallet and phone. Just as its name suggests, Cleverhood is a smart choice for anyone who refuses to let a little rain (or even a lot) get in the way of walking the dog, riding to class, or heading to work on foot. Whatever the day holds, grab your Cleverhood and go. Based in Providence, R.I., we created the eponymous Cleverhood, a smart-looking, high-performance street cape. The ‘hood is designed, crafted and manufactured in the US, putting good people to work. Our products are carefully crafted to ensure quality and reliability. We’re not just saying that. They’re designed for active people who are looking for a special combination of style and performance. That means they need to be well built. We think the Cleverhood offers a special way for people to get out and experience the rain — rather than just getting wet. Very nice, but way too expensive for most people and for the type of product. Should be in the $130 - $170 price range, and would sell a lot more. Good luck! I'd LOVE to have one of these, but I agree about the price range. I hope this isn't the result of "Made in America," but suspect that's part of the rationale. Good luck! @Barbara Thanks for the feedback. Our garment is actually comparably priced to equally high-performance garments produced by off-shore made companies. It is jammed with premium components and materials and sewn with the highest quality workmanship. @roxanne Thanks! My father was in the military so the poncho as the ultimate rain garment was not foreign to me...using technical fabric, high performance techniques, clever components with sharp looking fabrics seemed like something I could really use. So glad to see it resonates with people all over the world. Rain is something we can all understand! Glad to hear that you know so many all-weather people - love it! Love the concept, but not within my price range. Besides the zipper neck, and chest pocket, I'm unclear what differentiates this product from the $30 poncho the Army issued to me. I understand they manufacture those by the truck-load, but I would have expected $50-70 (roughly "twice as much") for a similarly sized custom garment. @Guest The "breathable membrane" (e.g. GoreTex?) fabric is probably the reason for the cost. A GoreTex jacket would be in this same price range. I question the necessity of such fabric, because there is no need for a "breathable membrane" on a garment that does not seal (like a jacket), and gets plenty of airflow because it's totally open on the bottom. The designer could probably hit the $50-70 range easily, if they just used standard ripstop poncho material. As another Army poncho user, I'd love to see a true outdoors military-style poncho retrofitted with these same features of this "urban cape". Thumb loops, a zipper, a pocket, and a brim would all be very welcome features. Don't put magnets in an outdoorsman-version though, as they will throw off compass headings. @Guido we like how you think. Our magnet closures are a favorite as they snap shut automatically which is nice in a deluge. Hadn't encountered any compass issues but very good food for thought. The military poncho is a major source of inspiration for me, so useful, so enduring. We were excited about adding some modern touches (fully reflective, waterproof breathable fabric, thumb loops...) to battle some of the current day issues. @Susan Can you elaborate on what drove the decision to use a "breathable membrane" fabric? I'm assuming that one of the largest contributors to the cost, but also seems intuitively unnecessary due to the circulation afforded by the poncho design. Did you test designs that just used coated (and far less expensive) "poncho" fabrics, and found them retaining too much moisture? Was using the membrane necessary so that you could use more-stylish non-waterproof fabrics, and make them waterproof with the membrane? Was it not possible to sew pockets and magnets into designs made of standard "poncho" material? I know my wife would LOVE one of these, and I have no aversion to buying expensive technically-capable gear, but I'm struggling to understand whether the design choices that generated the high cost are advantages to me. If you could just please share what design constraints drove the use of such expensive, exotic materials [for a poncho], it would be a great help! Another American made product, that's just FANTASTIC. Unfortunately the price is just too prohibitive for me to handle with what's left over after our federal and state governments get their "fair" share, so they can "share the wealth". @Guest We hear you. Staying dry is just another challenge. We often participate in events supporting livable cities with local organizations all over the country promoting walking/biking and public transportation in urban areas. Look for us, these organizations often raffle off a cape to further support their mission. unbelievably expensive...what is the rationale? @Tricia Hi Tricia- selling a garment online has it's challenges, one of which is the inability for you to touch and feel it. Our 'hood is made from high performance fabric with a waterproof breathable membrane, a durable water repellant coating on the outside and fully seam sealed - which means anywhere there is stitching on the underside we apply a seam tape with pressure and heat to make sure there is not leaking. In addition we used the best zippers - YKK uretek zippers, magnetic arm closures, 3m reflective trim. We designed it to be flattering on both men and women and to accomodate carrying all your stuff underneath. This last Christmas Forbes magazine put our garment at the top of the gift list, they said it's the gift your friend "didn’t know they needed, because they didn’t know it existed, but they’ll want a Cleverhood "
Nice poncho but I prefer to keep my wallet in my jacket pocket under the poncho. Just as easy to get to and won't get wet when I open the pocket. Looks like A nice poncho for people who don't know what money is. @Michael That's the beauty of a poncho profile, your stuff (backpack, messenger bag, purse...) is staying dry with you under the garment. While the price is not the price of the disposable plastic poncho it is a technically advanced garment featuring waterproof-breathable fabric, FULLY seam sealed, insuring that you stay dry both from the elements and from sweating! 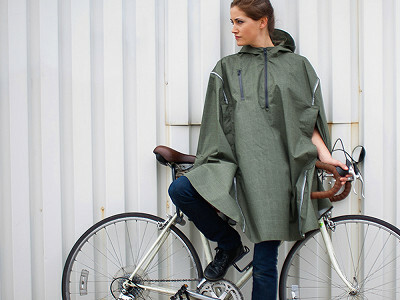 If you can't afford a car, you probably can't afford a $200 rain poncho. @Guest People that give up cars do it for so many reasons and often a great benefit is the savings. Unfortunately weather can be an enormous challenge. Insuring that you arrive to your job not soaking from the weather or sweat from being wrapped in a non-breathable garment, safe (our garment is fully reflective) and even looking sharp is pretty important. 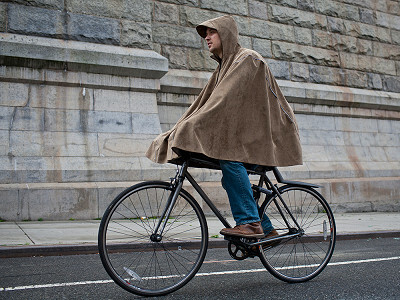 About 15 years ago I purchased a rain cape at a craft show from a French woman who told me the fabric was "breathable". At that time, the cape was over $300 and it still looks like the day I purchased it. I would not be able to live without it. This rain cape may be made out of that fabric and has the added advantage of a zippered pocket. I wish I needed another one because I would have preferred to have gotten one made in America. I wish you good luck in your endeavor. Thanks for your comment. Lifetime value really can't be beat! @Amy So glad to hear you found an enduring product, it's a great feeling. We get thank you emails from our wearers all the time saying similar things, a tremendous source of pride for us. What temperature range is this comfortable in? How would it feel say at 85 F in the rain? @Diane Great question. The capes featured here are all year-round weight. Luckily the profile itself allows for great circulation combined with the breathable membrane we find that even in steamy conditions the cape keeps you dry - outside and in. I love the design and the durability. Even better, is the fact that it is mad in the USA. The price is prohibitive to our budget. I put it on my wish list! Will you be adding a children's version? @Amanda Putting good people to work here in the US is pretty important to us too! In addition to make the tweaks and changes that need to be done with a high performance garment it is important to be able to communicate clearly and quickly to our producers. So glad to hear we might end up on your wishlist! When we first tested the garment one our beta users was pregnant and raved about the garment for her growing size. A couple of months later she raved about the fact the garment covered her new baby in a front carrier, the zipper extended to the top of is baby head. Pulling out a carriage in pouring rain is a drag! Seems like moving into a child's version would be a nice next step, thanks for the encouragement. Great conversation, thank you everyone. It is expensive, no doubt. Also...functionally superb, made with the most innovative, technical materials and manufactured locally...right here in America. The creators of Cleverhood could have chosen to strip out features, in favor of lower costs and a broader consumer audience. They did not. It's quite possible that this cape will last 4X longer, work 5X better and be loved 10X more than other, more ordinary rain capes. There's value in this type of design and innovation. That's why we're supporting Cleverhood at The Grommet. It`s a great concept for a raincoat but $ 239.00 is way too much. I've seen a lot of comments regarding the cost and thought I'd throw in my 2 cents. It seems expensive; however, if you were going to buy a really good rain coat that's going to last (think Burberry) I can see why the cost. You're not purchasing this to wear for one season. I can see where you'd where this for years and consequently it's worth the money. Whereas a cheaper one would last for maybe 2 years this appears to be something that would last quite a bit longer. @r.l. Thanks R.L., we agree. Investing in quality, lasting gear saves time and money and is more sustainable. Thanks for your thoughtful addition. @Susan and @R.L. 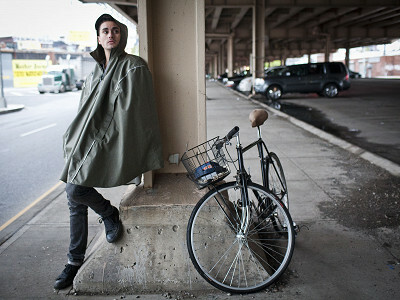 - I have a London Fog rain coat that has held up fanstistically for at least 10 years. It is good quality, a classic cut (just got a compliment on it last week) and even at the price I paid at that time wouldn't be that much in todays market. Would love to own, but even at $100 less, would have to think twice. Cool product but I have to agree with the other commentators, too expensive. Sadly, I strive to purchase local products but I find they are often over my price range - same with vegan fashion. I am certain it does have great features but for that price, I'll stick with my current rain coat. I see this is made in USA, but is the fabric from here as well? I see the rain wrap is from China. This is my year of ethical fashion and this poncho is expensive and I am betting the fabric is from Bangladesh. Great product but too expensive for me as I wanted to buy them for my family (6 in our family with 4 in college!). Good luck in your launch! I think your niche of high quality, ultra durable, multi-faceted application will really cultivate good sales for you! Take care! There is a population who could benefit from the Cleverhood on a much more practical level: handicapped people who use scooters, wheelchairs, and possibly walkers. I happen to be a mobility scooter user & have literally spent YEARS looking for a decent poncho that would cover me, my seat, and even my tiller. I found something on a Brit website that was made specifically for this purpose, but it was expensive & the shipping was VERY cost-prohibitive. I live in SoCal & we may not get a LOT of rain, but as the song goes, it POURS when we do have rain -- and this "super-poncho" may have been just the ticket during the recent heavy storms we had at the end of February: I had an important appointment to keep & got totally DRENCHED in the first minute! I figure the ample space to accommodate a backpack could become space used to cover my scooter seat. Does that sound like I'm on the right track? To be honest, the image for Susan looks to me like a gal seated on a wheelchair or scooter & protected by the Cleverhood -- if so, it looks like it would be ideal for folks like me. Thank You -- and I look forward to finding out more about the Cleverhood! For those who believe that life isn’t about waiting for the storm to pass, Cleverhood is a lightweight, yet hardy rain cape that lets you stay the course. Designed for city living, cycling, and commuting, this raincoat is loaded with innovative features to help keep you and your backpack or messenger bag dry even in a downpour. Made in the USA of durable, waterproof fabric, tightly seam-sealed, and carefully crafted, the Cleverhood features a fitted hood with a large brim that keeps your face from getting wet without blocking your peripheral vision—it even fits comfortably under your bike helmet. An outer loop on the back allows you to hang a safety light for traveling at night (some styles also come with reflective trim). Velcro tabs enable you to streamline the cape for a more fitted look. Magnetic closures on the armholes are a snap to shut and elastic thumb loops keep the Cleverhood secure when riding in the wind and rain. With its water resistant zipper, the chest pocket is perfectly suited for your wallet and phone.